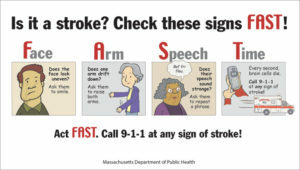 Every year in Massachusetts, 18,000 people have a stroke. Getting to the hospital immediately is crucial, yet on average a person suffering from stroke is admitted into the hospital 22 hours after the first signs of stroke! This delay increases the effects of a stroke, including moderate to severe impairment, and in some cases death. 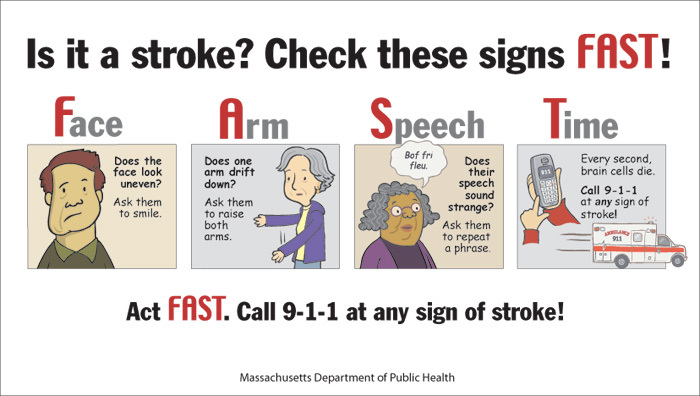 Concerned by the lack of awareness about the signs and symptoms of stroke the Massachusetts Department of Public Health partnered with us to increase recognition and quick response. Branding the FAST method was the perfect way to efficiently educate audiences on stroke symptom recognition while driving home the urgency of a timely response. But how could we make this appealing to general audiences? Together with our partners at Fablevision we developed a 3-minute animated song as the centerpiece of the program. The animation was designed to educate audiences and emotionally connect with them through warm and approachable visuals, catchy lyrics, and repetition of the message. An educators’ program as well as a mass marketing campaign were created based on the animation, increasing the opportunities for those in the community to learn the signs of stroke. The program has received awards and accolades from Health Educators across the state, who are using it in many ways. And anecdotal information points to people calling early because they “saw something on TV”! While the program was designed for statewide use only, thirty-four other states have requested the materials and several have begun using the program. STROKE – English PSA (30 seconds) from GEOVISION on Vimeo. Stroke Heroes Act FAST Animation – English from GEOVISION on Vimeo. ¿Sera Que Es Un Stroke? Stroke = Ataque Cerebral (30 seconds) from GEOVISION on Vimeo. Ataque Cerebral = Stroke from GEOVISION on Vimeo. Será que é um STROKE? STROKE = Acidente Vacular Cerebral (3min) from GEOVISION on Vimeo.